$25 early advance thru 10/31! Nite Wave - Seattle, WA - (NiteWaveParty.com). 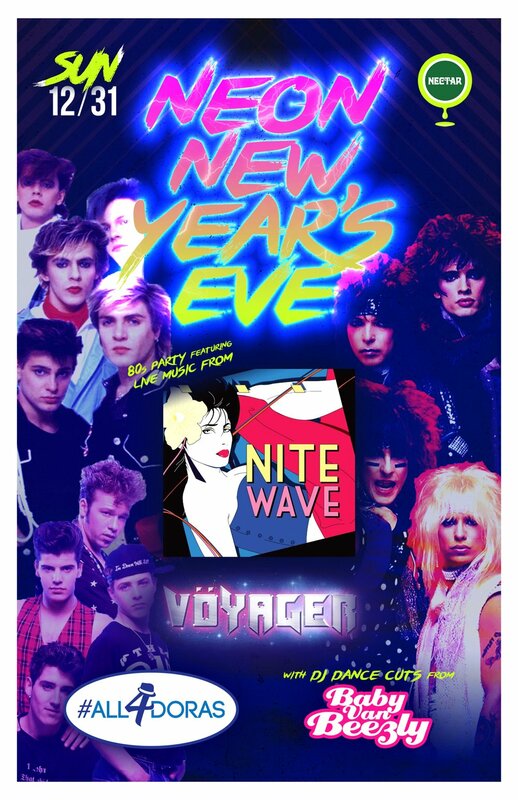 Known for their high energy show, Nite Wave continues their 80’s dance ways performing New Wave hits from Duran Duran, INXS, Frankie Goes to Hollywood and more! Most noted for being handpicked by Billy Idol to open for the legendary 80’s rocker at Showbox SoDo in October 2012, Nite Wave has help raise over $17,000 for Northwest Harvest, American Red Cross and Planned Parenthood. Voyager - Bellingham, WA - Voyager brings the 80’s Hard Rock Thunder as the co-headline this ultimate night of everything 80’s for the first time ever. Coming from Bellingham, WA, Voyager will be ripping Guitar solos from Van Halen to Motley Crue to Ratt. #All4Doras - Seattle, WA - Seattle's first Boy Band Cover Band! Playing in front of Sold Out shows at Nectar Lounge these four guys now how to get a party started. From N'Sync's "Bye Bye Bye" to Backstreet Boys "Everybody" these dude have got the moves covered. They are now ready to take over the 80's and the likes of New Edition and New Kids on The Block! DJ Baby Van Beezly - The party starter herself takes over the turntables to bring the energy your New Year's Eve has been missing! All dance jamz all night long!